Trollfest is confirmed for Malpaga Folk & Metal Fest in Cavernago , Italy, 26 July 2019! We got super excited when one of our all time favorite bands, Korpiklaani, asked us to do a TrollfesT version of one of their classics. Today we get to share it with all of you! Grab a beer and enjoy "ØL ØL"
Trollfest is confirmed for Udgårdsfest in Copenhagen, Denmark, 31 May 2019! Our second single "Kjettaren mot strømmen" is now available on most digital platforms. Trollfest is confirmed for Nummirock in Nummijärvi, Finland, 20 June 2019! Trollfest is confirmed for Hellfest in Clisson, France, 21 June 2019! Our first single "Espen Bin Askeladden" is now available on most digital platforms. Our new album, "Norwegian Fairytales", will be released 18th of January 2019. To celebrate this release we'll throw a big party at Rock In in Oslo on 18th of January. We will also visit Finland for the very first time! We will play together with our friends from Korpiklaani in Helsinki on the 25th of January and Tamperer on the 26th. Trollfest is confirmed for Copenhell Metal Cruise going from Copenhagen to Oslo, 26-28 October 2018! Trollfest is confirmed for HRH MetalFestival in Birmingham, England 16. February and Wacken Winter Nights in Wacken, Germany 22. February 2019. We will also join our good friends from Korpiklaani and Turisas on yet another European tour from mid February to mid March. Check out our live-section for a complete list of dates. Trollfest is confirmed for Meh Suff Metal-Festival in Hüttikon, Switzerland 7-8 September 2018! 21.04.2018 - New merch has arrived! We have added some new merch for you all in our European Webshop (ships wordwide), Head on over and get your hands on new T-shirts like Hen of Hades and TNBM. We also have a new Helluva Zipper/Hoodie and Helluva girlie! Trollfest is confirmed for Goessnitz Open Air in Gößnitz, Germany 4 August 2018! Trollfest is confirmed for Sabaton Open Air in Falun, Sweden 15-18 August 2018! We will be spelunking at Hard Rock Cafe in Oslo February 8th. Trollfest is confirmed for Wacken Open Air in Wacken Schleswig-Holstei, Germany 02-04 August 2018! We will be spelunking at Garage in Bergen February 2nd and Tribute in Sandnes February 3rd 2018. Trollfest is confirmed for Rock Harz Open Air in Ballenstedty, Germany 04-07 July 2018! Girls and boys of Australia, it is time to pull out your favourite pick axe and headlight because we are coming for our “Balls Out Spelunking Down Under Tour” in January 2018. Together with Troldhaugen and Valhalore we will visit Brisbane, Sydney, Canberra and Melbourne. Check out our live section for more info! Wohoooo!! Trollfest is confirmed for Boarstream Open Air in Buchenbach, Germany July 21. 2018! We are super excited to go to Japan for the first time together with our friends from Ensiferum in 2018. We are proud to present the video for Hen of Hades. Join the trolls on their adventure to the center of the earth. They encounter the horrible and super evil Hen of Hades on their way. Will they survive? See for yourself. Trollfest is confirmed for Hamburg Metal Dayz in Hamburg, Germany September 23. 2017! Trollfest present one Helluva European Tour!!! The dates have been announced! Check our live page and mark the calendar! Joining us on the festivities will be Korpiklaani, Heidevolk and Arkona! Dates and more info to come soon! Trollfest present one Helluva European Tour!!! You have seen and heard us as dirty cavemen, plump and feisty bumblebees with severe Edipus complexes and insane scientists with megalomaniacal delusions of drunkendom! Now be prepared as Trollfest takes it even further! You have heard our new album HELLUVA, you have seen our new videos, you have been active online, in your car, at work and in your living room! You have waited and prepared for this for what seems like ages!! Finally, we are hitting the road! We will tunnel, dig and spelunk our way through Europe once again! We can not wait to show you all our equipment (and climbing gear) and we encourage you all to dress up, drink up, saddle up and come on down to whichever city closest to you! Electric Spelunking Madness is GUARANTEED!!! Now it is up to YOU to make every night complete and completely insane! Front row or death!! 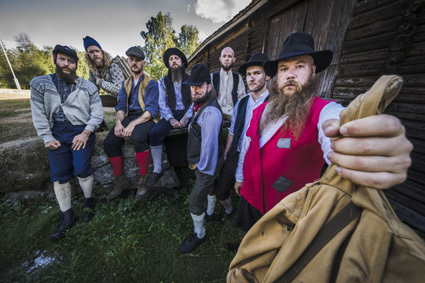 Joining us on the festivities will be Korpiklaani, Heidevolk and Arkona! Trollfest is confirmed as support for Rammsund at Sentrum Scene in Oslo, Norway April 22. 2017! Trollfest is confirmed for With Full Force in Ferropolis, Germany June 24. 2017! Our newest member, Fjernkontrollet, wanted dearly to make this appeal in order to achieve the same legendary status as the rest of us, but also to remind all of us not to take ourselves (or this video) too seriously. Please enjoy this video as much as Fjernkontrollet did! Scandal and tragedy! 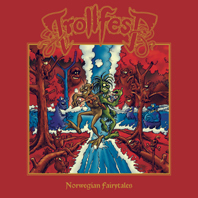 Trollfest have been neglecting Norway for a long time! But fear not, redemption is at hand! In May, the Trolls will expand the expedition throughout their Motherland, and they are ready to spread their mad joy of playing, and of course their new album, HELLUVA, over the fjords, mountains and straight into your hearts. It will be the craziest norwegian metal show ever (that's a garanty), bereft of self-importance and pretentiousness, but full of pride and radiance! Trollfest are in ecstasy over their latest creation, and HELLUVA will be showcased with both funk and ferocity! If you know what's good for you; bring your best beer holding device, jump (or squat) on down to your local stage and join the madness! Trollfest is confirmed for Sylak Open Air in St. Maurice Gourdans, France August 6. 2017! Trollfest is confirmed for Skaldenfest Open Air in Würzburg, Germany June 17. 2017! We had the honor to contribute some True Norwegian Balkan Metal to JT Machinima´s new song FOR HONOR. 24.02.2017 - HELLUVA has been released!! New music video. Enjoy our new music video from the song "Professor Otto" while you wait for your copy of HELLUVA to arrive in the mail. 2 more days and it's release day! :O We can't wait! Check out part 2 of our in-depth track-by-track video where we explain writing processes, different gear and the creativity behind your new favourite songs! Hints: Russians, troll-soup and B3. We are drawing ever closer to the release of HELLUVA! In this features we will take you through track by track, explaining the story, the ideas and the musical concepts! Hints: Hens, laughing, snakes, girl power! WARNING! This video includes SPOILERS and SAMPLES of 7 of our new songs! We are proud to present FRÂULEIN HELLUVA. Join the trolls as they embark on their quest to locate the mother of all trolls, Helluva. The quest takes them deep inside the center of the earth, and what expects them as they reach their goal is the stuff of nightmares. "Fräulein Helluva" is now available as an instant download, when you pre-order »Helluva« digital. The single is also available on all digital platforms. Trollfest is confirmed for Barther Metal Open Air in Barth, Germany August 18. 2017! Listen to FjernkonTrollet & TrollBANK presenting all of the instruments we used on our great new album, HELLUVA, which will be out February 24th! Trollfest is confirmed for Santa Maria Summer Fest in Beja, Portugal June 8-10 2017! Listen to Trollmannen & Mr. Seidel presenting the cover, the characters and a tiny bit of the story on our new album, HELLUVA, which will be out February 24th. 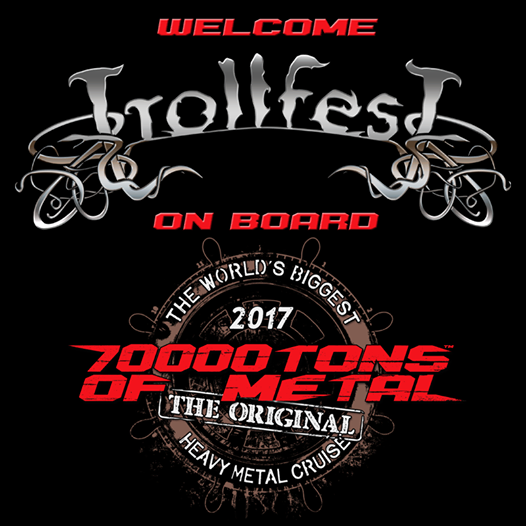 Trollfest is confirmed for 70000 Tons of Metal in Miami/Haiti in February 2017! Trollfest is confirmed for Masters of Rock in Vizovice, Czech Republic in July 2017! We are proud to present STEEL SARAH. She climbs caves and slays snakes with maximum feminine ferocity!! Eat your heart out, Arnold Braunschweiger!! "Steel Sarah" is now available as an instant download, when you pre-order »Helluva« digital. Look at our splendid cover people! We have once again allied ourselves with the ever brilliant master pen Jonas Darnell. As you can see the cover has a picture of Professor Otto, Camouflage Clair and Steel Sarah while they are running from something deep in the caves of the earth where they are looking for the mother troll Helluva. Unplugged you say? Yes, we will play an acoustic concert in Oslo November 20. The place to be is Uhørt. Our new album, HELLUVA, will be out FEBRUARY 24th, 2017! Out of Kaos, into more Kaos! We have been holding this close to our hearts for some time now, but finally, oh finally, the sweet release is upon us! Our new album is here! To our joy and satisfaction, it will be released February 24th, 2017! We call this beautiful baby HELLUVA, and she is the result of many long months of demoing, arranging, recording, re-recording, cutting, compressing, computing and confusing, laughing and loathing, singing and screaming, spitting and sneering. The pride we have for this album is unfathomable, and we are so happy to finally share it with all our lovable fans! Like the perfect omelette, we also busted quite a few eggs (braincells and bloodvessels) during this conception. So even though we still produce a helluva mess in the kitchen, the meals we make are always tasty to the EXTREME! So here we stand at the brink of the coming release, shivering with anticipation, ravenous for road rage and trembling with tenacity! HELLUVA comes with a 100% "Knock-your-socks-off guarantee", that is a promise! We have one hell of a great thing to tell you! You won't hear the fantastic news until OCTOBER 5TH, so in the meantime you can satisfy ears, eyes, heart and brain on this! Our most iconic t-shirt, "Villanden", has been released on even more types of merch. In addition to the normal black T-Shirt we now have Girlie Tank Top, Grey T-Shirt, Base ball Longsleeve, Unisex 3/4 raglan Longsleeve, Girlie V-Neck Black and Girlie V-Neck White. Head on over to our European webshop to get yours. Quack Quack!!! 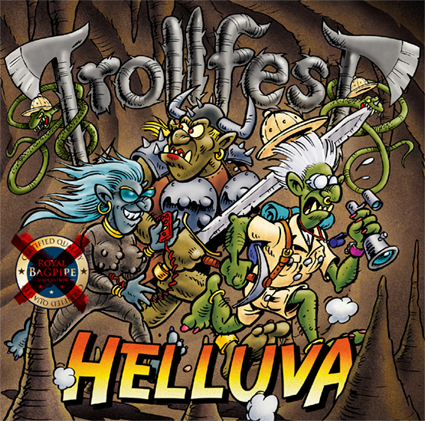 Trollfest is confirmed for Rock The Paddleboat in Hamar, Norway the 20.August! Trollfest is confirmed for Midgarsblot in Borre, Norway the 19.August! Trollfest is confirmed for God Nok Festival in Steigen, Norway the 14.July! Trollfest is confirmed for Wave-Gotik-Treffen in Leipzig, Germany on 13.May-16.May and Xtremefest, Cap Decouverte, France, 29.July. Cya there! 08.03.2016 - Villanden is back!! Our most iconic shirt is finally back!! After high demand we decided to repress our famous shirt, the one and only "Villanden"! 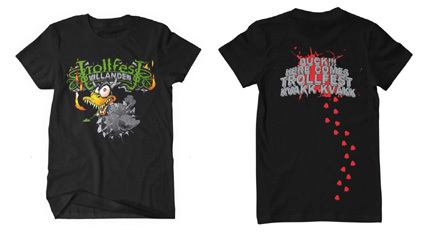 We also restocked our "This is my TrollfesT shirt"-shirt. Head on over to our new European webshop to get yours. Quack Quack!! !